One of Fremantle’s greatest attractions is its coastline of pristine beaches on the edge of the Indian Ocean. The City’s four main beaches are perfect for swimming, relaxing, kite surfing, paddling and other leisure activities. They offer a range of facilities that can be accessed year round and are utilised by locals and tourists alike. 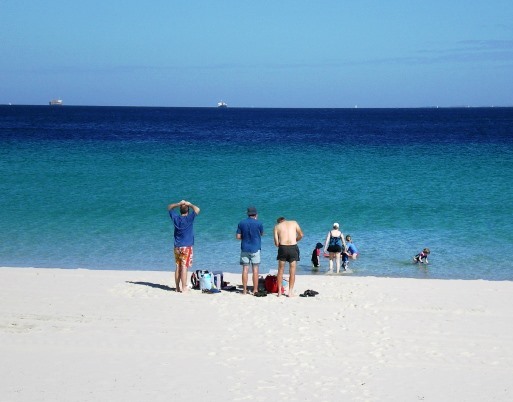 Visit Google maps to find the location of Fremantle beaches. South Beach is located in Fremantle’s inner harbour, close to the centre of Fremantle. This family friendly beach has superb views of Rottnest, Carnac, and Garden islands, and is the perfect place to enjoy a swim, a picnic or BBQ. Enjoy a coffee or a meal at the relaxed beachside cafe. A beach wheelchair is available for free use from the City. This popular beach inner city beach, located between Fishing Boat Harbour and the Round House, is the perfect place to relax and swim. Enjoy fish and chips and watch the sunset. A beach wheelchair is available for free use from Shipwrecks Museum. Close to Port Beach, Leighton Beach is another white sand spot perfect for swimming and watching the sunset. A grassed area is located a short walk up from the beach with electric barbecues, picnic tables, toilet facilities and a kiosk. Cafe and restaurant options are also available nearby. Dogs are permitted in designated areas on this beach. A beach wheelchair is available for use, courtesy of the Disabled Surfers Association WA. To book contact the Fremantle Surf Life Saving Club.